This is crazy! Recorded in 2007, back then still named Allie Total Blam Blam, Allie Parker's debut album got a proper release a few weeks ago. 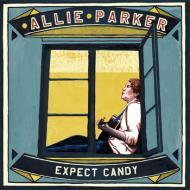 The label whose posting you're reading right now took it's name from one of Allie's songs, the album was supposed to come out on Expect Candy back then - for some reason it didn't work out. But Allie is one of the good guys and the record is awesome, period. Not only because he called it...right, "Expect Candy".